I'm ever so happy to announce our new app New Word. It's a simple random word generator (based on a setgetgo.com api). If you like words you'll probably get a kick out of this app. It uses iOS 6's new pull-to-refresh table view. Just pull down on the list to get a new word added. Tap a word to get a definition, or press-and-hold to copy the word or tweet it. Get it now in the App Store. CatPaint 2.2.2 is out now. Crashing bug on iOS 4/5 and some older devices is fixed! CatPaint 2.2.1 is out now. Fixes an issue with Instagram sharing on iOS 6. I'd like to announce our strangest app yet! Guitar Pick. A friend of mine recently told me about another mutual friend of ours using his iPhone 3GS as a guitar pick. I figured more than one person out there has done this, so I made this app. Choose from a bunch of guitar picks, then play away. The Shredometer&mark; will let you know how fast you're ripping out those licks. If you shred your axe hard enough, flames, smoke, or ice will spew forth from your plectrum! CatPaint 2.2 is out now. Fixed a bug where lasers would not be coming out of the cats eyes, on iPad. CatPaint 2.1.2 is out now, and it features a Halloween surprise and a number of useful bug fixes. Added four free halloween cats (only available in late October). Fixed bug where sharing windows wouldn't close in iOS 5. Fixed image orientation problems (for good this time). Flipping cats no longer makes them get slightly bigger. I'm a huge fan of the CBC, Canada's Public Broadcaster, and particularly CBC Radio. I listen virtually every day, and I am a big proponent of how our national public radio service unites the country. I use their iPhone app a lot, but their website has a flash-based player that I find clunky and rarely use. About six months ago I made a Mac app to play their radio streams, so that I wouldn't have to use the web player on my Mac. I recently polished it up a bit, and began selling it in the Mac App Store. On August 23rd I received a notice from Apple that CBC had filed an infringement complaint against my app. I sprung into action immediately, and within two days I had submitted an update to Apple. The update changed the name, removed all references to the CBC in the app description, and removed the CBC logo from the icon and from the app. 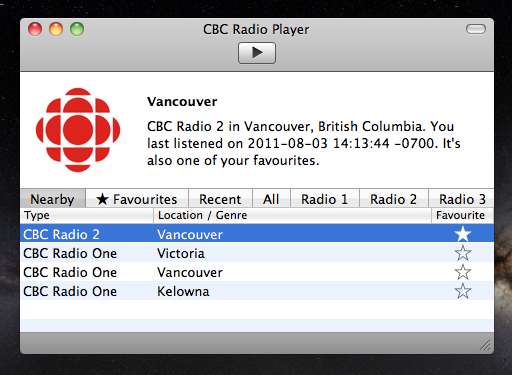 "CBC Radio Player" became "Canadian Radio Player". Not as snappy a title, but I realize their need to defend their copyright and avoid confusion. I used the logo only because I was trying to communicate what the app was for. In retrospect I should have taken the time to find a clearer way to communicate that. This was my mistake, and I responded promptly to fix it. I notified CBC legal of the changes, and the update became available within a week. The next thing I heard is another notice from Apple, saying that the CBC had asserted that I was still infringing on their copyright. Apple informed me that my only option was to resolve the issue with CBC directly. That is a completely false characterization. What I have made is essentially a radio receiver. They are broadcasting audio streams online, much the same way they broadcast radio signals in all major Canadian cities. 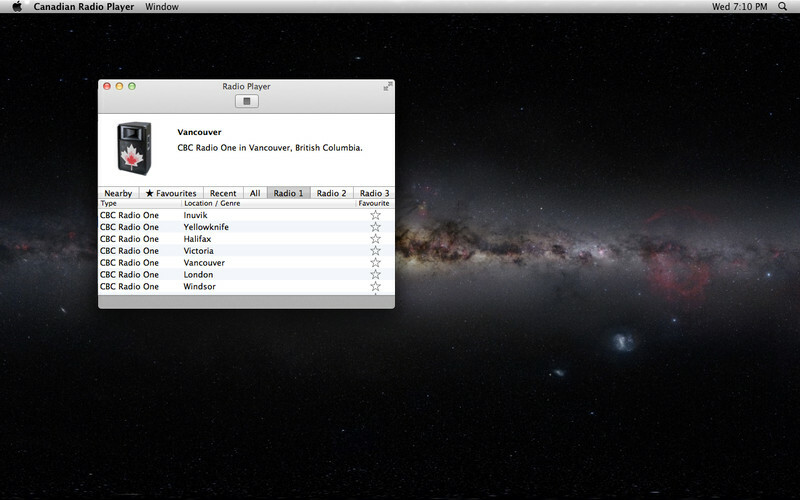 My app, Canadian Radio Player, simply tunes into those broadcasts. My app does not contain, package, or distribute any CBC content. It downloads a list of radio stream URLs published on the CBC website, and then plays those streams at the users request. What part of that is infringing? 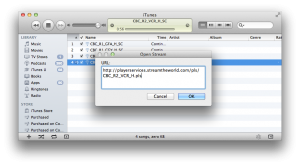 The stream URLs can be accessed with any web browser, the streams can be played by any media player. If my app is infringing, so are iTunes, Windows Media Player, Safari, Internet Explorer, and Firefox. So is your car radio, for that matter. 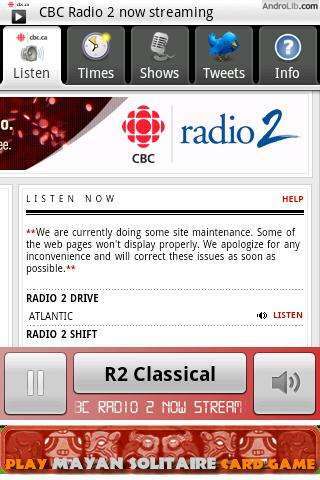 Technical concerns aside, CBC is in the business of making their radio content available to all Canadians. It's in their mandate. These streams are currently easily available to anyone with Adobe Flash Player, an iPhone, iPad or iPod Touch. Why should they stomp on an independent developer trying to expand the ways to listen, and who does that serve? It's a lose-lose-lose proposition for the CBC, listeners, and developers. I will be forced to remove my app from the App Store shortly, because Apple (understandably) doesn't want to arbitrate issues like this. My hope is that someone at the CBC will see this post, and reconsider their strategy for internet streaming. 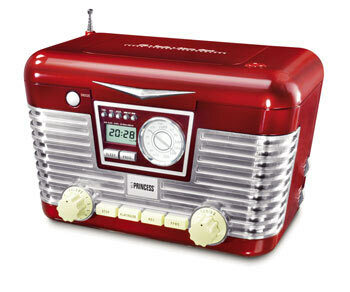 If this policy extended to physical radios, the only way to listen to CBC in your car would be with an Authorized CBC Listening Device™, and the only way to watch CBC TV would be with a TV made by the CBC. They are trying to control how we listen, instead of providing reasonably open access to their streams like a public broadcaster should, and letting the listeners decide how they want to listen. I think it's a bad policy, a misuse of their mandate, and I don't think it reflects the ideals that the CBC represents.